The Hair Shirt of Saint Aralor the Penitent is a sacred relic of the Dunmer. Besides being simultaneously hurt and healed by the shirt, the wearer is also resistant to magic, particularly shock damage. 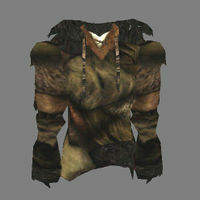 When an Ordinator carrying the shirt died in the Ashlands in 3E 427, the Nerevarine was sent to retrieve it, and was given the shirt as a reward for various services to the Tribunal Temple. The Hammer of Gharen is a legendary hammer created by the Dwemer Gharen. It is twinned with the Anvil of Mithas, and is the only object strong enough not to shatter when used to shape metal upon the Anvil. When the Hammer strikes the Anvil, it produces a ringing which reveals the location of the entrance to the Dwarven mines beneath Red Mountain. Late in the Third Era, the Hammer was lost in Black Gate, a dungeon on mainland Morrowind. During the Imperial Simulacrum, King Casik of Ebonheart had the Eternal Champion retrieve the Hammer. King Casik, who was already in possession of the Anvil, used the artifacts to craft the finest armor and weapons in the realm. The Hammer has never reportedly left the city's palace since. The Heart of Transparent Law is the stone of the Crystal Tower. It was taken from the Tower shortly after the founding of the Mages Guild in 2E 230 by Ritemaster Iachesis of the Psijic Order, who was under the control of K'Tora of the Abyssal Cabal through the use of mind magic. In a desperate attempt to keep the Sea Sloads from using the Heart to sink Summerset, Iachesis enlisted the help of Nocturnal to hide the Heart inside his own body. During the Interregnum, Nocturnal tried to take control of the Crystal Tower. Using a technique she stole from Sotha Sil utilizing life energy as a power source, she planned to use the life energy of Nirn, and then the energy of the other Princes afterwards, to amplify the Crystal Tower to make her power limitless. Nocturnal's plan was foiled by the Psijic Order and the Soulless One, with the assistance of Mephala and Clavicus Vile, who had been betrayed by Nocturnal, and the Golden Knight, who was the vessel of Meridia. Using the divine power of Meridia's Dawnbreaker, the Soulless One defeated Nocturnal and restored the Heart of Transparent Law. 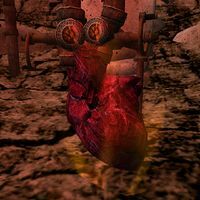 The Heart of Lorkhan was the "divine spark" of the deity most commonly known by his Aldmeri name, Lorkhan. It appears in other cultures as concepts such as Heart of Shor, the "hunger" of Sep, and others. The "star-wounded East" gained its name when the Heart fell from the sky like a meteor, crashing into the Vvardenfell region in ancient times, where it formed Red Mountain. In the mythology of the Towers, the Heart of Lorkhan was known as the First Stone, the Stone of Red Tower (Red Mountain). The Helm of Oreyn Bearclaw or the Helm of Kharag gro-Khar is a prized artifact which once belonged to the legendary Valenwood hunter, Oreyn Bearclaw. Although legends claim that Bearclaw performed many great deeds, these were falsely credited and were actually performed by his friend, an orc named Kharag gro-Khar. After Bearclaw's demise, caused by the Knahaten Flu, his helm stood as a monument of his stature, although it was eventually lost after his clan split. The helm itself is an enchanted skull, which is said to improve the wearer's agility and endurance. Some time during the Second Era, during the reign of King Kurog, Kurog commissioned this helm to be recovered by Myvryna Llothri. Myvryna recovered it from Bloody Knoll, but was soon killed by Naryu Virian, a Morag Tong assassin. Naryu gave the helm to Gadnuth Oreyn, who presumably returned it to Valenwood. In 3E 427, Malacath sent the Nerevarine to end Bearclaw's bloodline and undeserved fame. The supposed last descendant of the false Elven hero was Farvyn Oreyn. Farvyn knew of his ancestor's falsehood, and sought to perform heroic deeds to justify his own fame. With his death, Malacath believed the family line to have ended and rewarded the Nerevarine with the helm. The Nerevarine then sold the helm to Torasa Aram, who put it on public display in the Mournhold Museum of Artifacts. 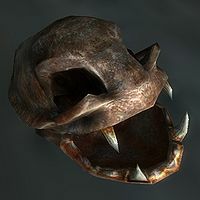 Some time after the events of 3E 427, the helm was brought from Morrowind to Cyrodiil and given to Modryn Oreyn, another descendant of Bearclaw who was unknown to Malacath. Modryn was the second-in-command of the Cyrodilic branch of the Fighters Guild. In 3E 433, after the Blackwood Company almost ruined the guild, Modryn gave the helm to the new Master of the Fighters Guild, who replaced Vilena Donton. Modryn hoped that the new Master would restore the Oreyn name to glory by wearing the helm of his ancestor. 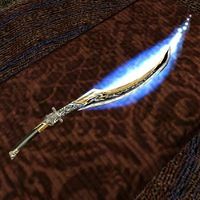 Hopesfire, the blade of Almalexia, is a one-handed Dwemeri sword from the early First Era. Hopesfire and its twin, Trueflame, represented the pinnacle of Dwemer craftmanship. They were presented as wedding gifts to Lord Indoril Nerevar and Almalexia by the Dwemer King Dumac. Though Trueflame was shattered during the Battle of Red Mountain circa 1E 700, Almalexia kept Hopesfire well-preserved over the years. In 3E 427, she wielded the blue-flamed sword during her final battle against the Nerevarine in the depths of Sotha Sil's Clockwork City. Hrormir's Icestaff, also called the Staff of Hrormir, was made famous as the mighty weapon of Hrormir, one-time champion of Nocturnal. It eventually fell into the hands of the Mages Guild. 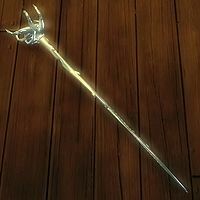 In 3E 433, the Thieves Guild stole the staff from the Arcane University in the Imperial City—evidently just to prove that they could, as it was soon returned to the mages' hands. The Hyperagonal Locational Determinator was a device created by Telenger the Artificer around 2E 582. 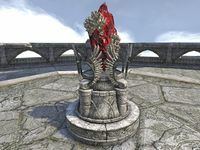 It allowed the user to teleport themselves anywhere they desired even to places that were protected by magical defenses such as Artaeum and The Clockwork City. Circa 2E 582, High Magistrate Rinwaray of The Divine Prosecution (posing under the identity of Penewen with an enchanted necklace) manipulated Telenger the Artificer to use his teleportation device on her to teleport her into the Clockwork City. There she planned to find Seht's Affect Inducer, a magical device entrusted originally to Barilzar that can manipulate a person's emotions. She planned to use it on Proxy Queen Alwinarwe for her own political gain and to revert the Summerset Isles to isolationism. Her efforts were stopped when Razum-dar caught wind of her plot and followed her tracks through the Clockwork City, the Evergloam, Artaeum (accidentally) and eventually caught her in Alinor where he managed to subdue her and now awaits the Queen's judgement. This page was last modified on 8 January 2019, at 23:02.